Pelikan’s fountain pen production spans nearly nine decades and more than a few mysteries have arisen over that time. Many of those puzzles relate to the provenance of certain models and are born largely from the lack of available documentation today. One lasting consequence of World War II (1939-45) has been the destruction of countless historic records. An area of fountain pen production that has been subjected to a fair bit of speculation has been the models attributed to Günther Wagner’s Danzig-Langfuhr plant. 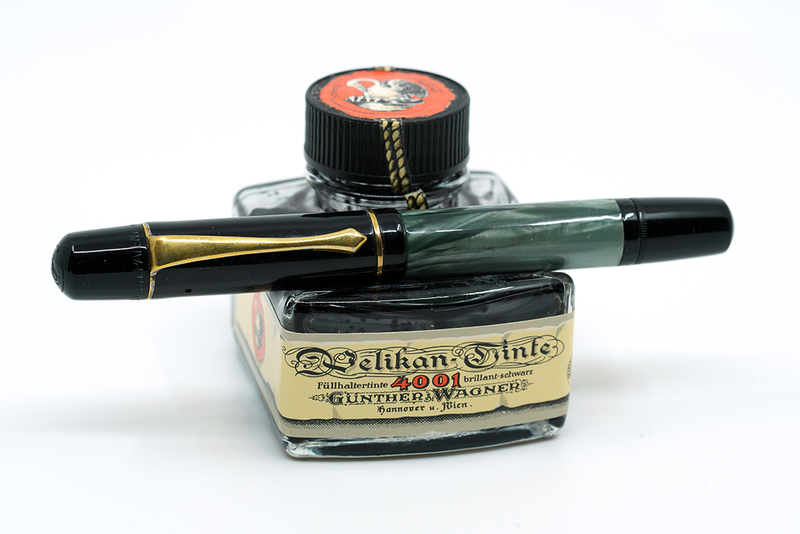 This facility is chiefly known for a unique version of the Pelikan 100N that has long been attributed to it. Danzig is the German word for Gdańsk, a Polish city on the Baltic coast. Following World War I (1914-18), the Treaty of Versailles established the Free City of Gdańsk, a territory that was under the oversight of the League of Nations. While largely influenced by Polish rule, the region remained fairly independent, acting as a conduit between Poland and Germany. The Polish or Danzig Corridor as this region was known was created so that Poland would not be landlocked or completely dependent on German ports. German citizens could cross the corridor by railroad, but were not permitted access to it without special authorization. Danzig’s unique status between the two nations prompted many German manufacturers to establish a presence there in order to sell goods in Poland without incurring the high customs fees that were usually levied on products from foreign companies. In the borough of Wrzeszcz (the Polish word for Langfuhr) during the late 1800s, brick carriage houses served as the base of operations for the troops of the 17th West Pomeranian Railway Battalion. Following World War I, those troops moved out of the region and the demilitarized area was turned into an industrial park of sorts. It was well suited to this purpose being on the outskirts of the city with a well-developed rail line running through the area. It is in this borough of Gdańsk where Günther Wagner would come to establish a factory. Due to a large population of Germans in the region, the Nazi party eventually came to demand that the city be turned over to Germany while the minority Poles hoped for a return to Poland. Hitler used the status of the city as a pretext for attacking Poland in September of 1939. I don’t think that it’s too much of a stretch to say that, at least in the United States, most people have heard the old saying about wearing white after labor day. It has been a big no-no in fashion circles since sometime around the early to mid-twentieth century. Nobody knows for sure how this piece of fashion etiquette came about let alone became ingrained into the mainstream collective. One practical theory contends that, since people used to dress more formally, white was simply cooler in the summer months. When the fall rains came, the color became impractical as it soiled easily with mud and debris. While this theory sounds logical, that in and of itself may be why many scholars discount it. The rules of fashion seldom seem to follow any logic. A more salacious and compelling explanation may lie in the habits of America’s well to do who frequently escaped the doldrums of the city in the summer months. That escape included leaving behind the more drab palette of the city which included opting for lighter clothing instead. White linen suits became the unofficial uniform of the upper crust of society. Labor Day, celebrated on the first Monday in September, has long marked the unofficial end of summer and was when the elite class would stow their whites and return to city life. By mid-century, a clash between old money and new money was brewing as the middle class expanded and people became more upwardly mobile. Old money elites looking to keep their social fabric from fraying would shun those not in the know. Arbitrary rules, including not wearing white after Labor Day, allowed high society to protect their standing and identify the less savvy newer members of the upper class. Whichever reasoning you may ascribe to, this old “rule” has largely fallen out of favor and many fashion icons have shown that white can indeed be worn year round. That is a darn good thing too because Pelikan has graced the M6xx line with more white pens in recent history than ever before and I for one would hate to have to lock them away for half of the year due to some fashion snobbery. 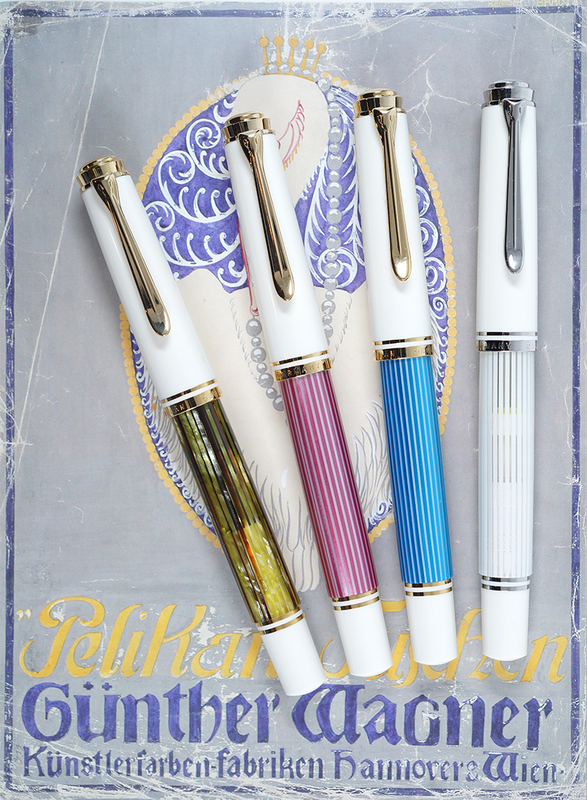 Read on for a look at how Pelikan has made white pens chic again. It is not uncommon for a company to enter into an agreement for the manufacture of goods meant to be sold and distributed by another business. These products are frequently meant to target a different market segment than the manufacturer’s usual wares. 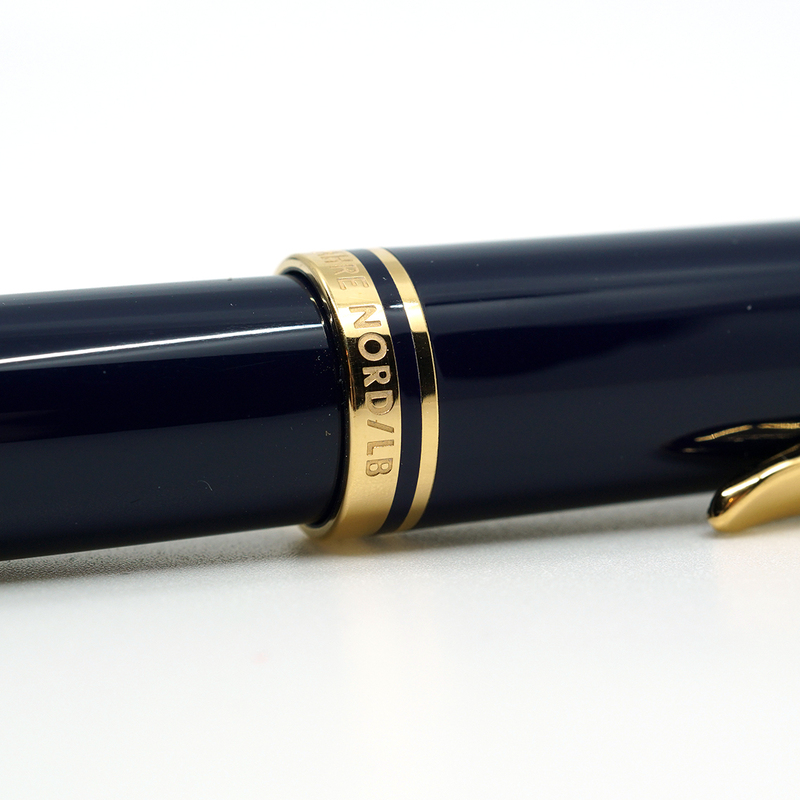 As far as fountain pen production is concerned, often times these pens are not tied to the original manufacturer by way of their usual branding. Despite the absence of those tell tale markings, the pen’s designs are not radically altered from that of a company’s standard production models and can be readily identified. The Taylorix company is an example of one such business that purchased a large number of pens from multiple manufacturers upon which they placed their own branding starting sometime in the 1930s. Today, I would like to focus on those Taylorix branded pens produced by Pelikan in the post-war period. Aside from the surviving pens themselves, very little information is know about these models. Pelikan’s archives contain little in the way of details and Taylorix is no longer in business. What we do know is that, for the most part, the Taylorix pens made by Pelikan included the 100N, 130 Ibis, and 140 produced sometime in the 1950s. In a more unusual twist, there has even been an MK10 or two seen with the Taylorix branding, indicating a relationship between the two companies persisted into the 1960s. Read on to learn what we know about these unique Pelikan manufactured pens. 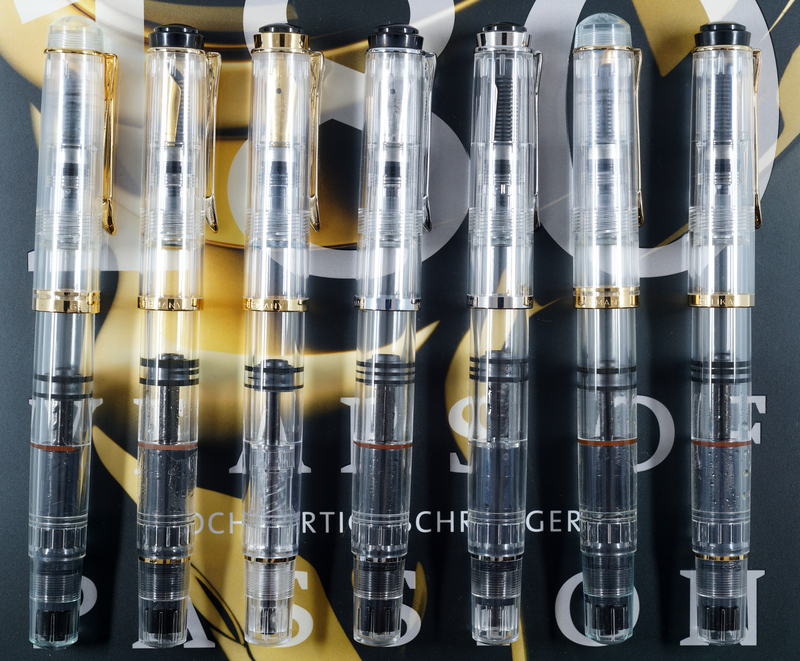 As far as demonstrator fountain pens go, the clear variants are perhaps the purest because they allow the most unobscured visualization of a pen’s inner workings. 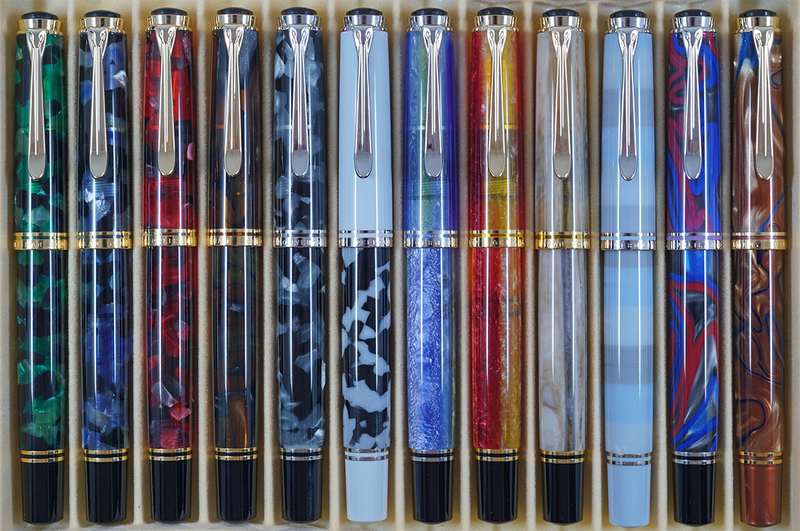 With this year’s release of the re-issued M205 Clear Demonstrator, I thought that it was an opportune time to look back at Pelikan’s clear M2xx models and to highlight some of the differences between each. 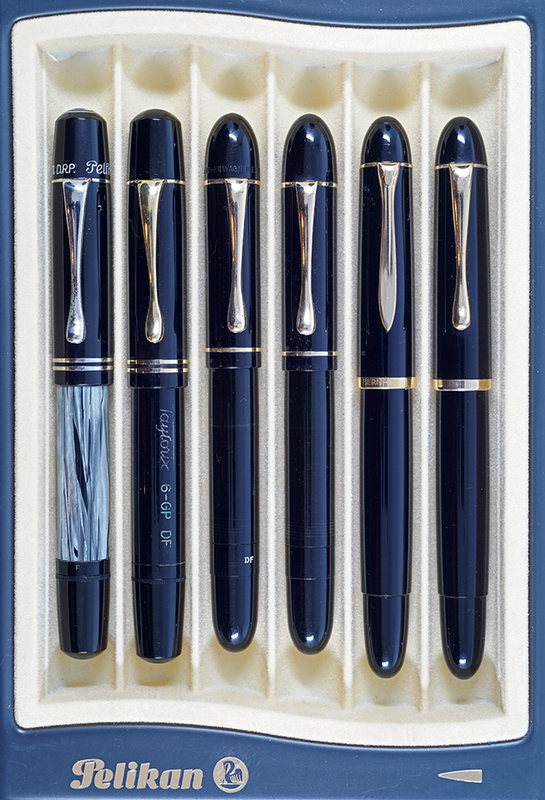 To date, there have been seven clear demos released in Pelikan’s lower tier Classic line, not including the very similarly styled M481 demo. These models are characterized by a less ostentatious trim than the Souverän series as well as a slightly less refined finish. The upside is that you get a great pen for substantially less money than what a Souverän might cost. While I was working on this article, my wife somewhat incredulously remarked, “You have seven of the same pen? !” While that may seem to be the case upon first glance, each pen has a unique variation or two that sets it apart and allows for proper identification (though that explanation somehow did not mollify my wife). Clear demonstrators draw both appreciation and ire for facilitating an unobstructed view of the piston mechanism as well as the ink chamber. Each fill with a different colored ink can serve to change the pen’s look, keeping the writing experience fresh and exciting. The trade-off, of course, is that without proper pen maintenance, those colors can persist long after a pen is emptied. While staining is a real possibility with any demonstrator, it can be all the more apparent in one of the clear demo variants. Still, proper pen care makes this a relatively small issue and one that shouldn’t bar you from enjoying such a great pen.